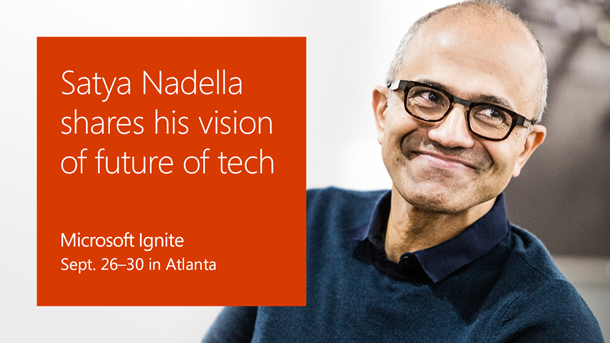 We’re pleased to announce that Microsoft CEO Satya Nadella will deliver the opening keynote at Microsoft Ignite 2016 in September. During the keynote, Satya will provide his unique perspective on the technology trends shaping the future of business and enabling powerful new ways for people and organizations to work. We’re working to deliver an amazing line up of product experts, top Microsoft executives and industry visionaries at Microsoft Ignite, making it the event for IT decision makers and professionals to get hands-on learning and industry insights. Stay tuned for more Ignite conference news in the coming weeks. Register now to join the IT community in Atlanta, GA from September 26 - 30.